The House of Commons managed to make one of its occasional sensible decisions last week by voting against the government motion to support American intervention in the Syrian civil war. It is very rare for the Commons to vote down a government motion on foreign affairs; in fact I believe it is the first time for 200 years; but it is all the more welcome for that. For once we have declined to be dragged along on American coat-tails and to get ourselves enmeshed in yet another Middle Eastern imbroglio, the consequences of which are unforeseeable but very possibly catastrophic, as per the Iraq fiasco. There are many good reasons not to support the bombing of Syria. For starters it is still by no means certain that it was Assad’s regime that was responsible for the chemical attacks on a Damascus suburb that has provoked Obama’s ire. It is hard to see why Assad would do the one thing that would bring American (and perhaps British) intervention on the side of the rebels, given Obama’s comments about the use of chemical weapons being a “red line” last year. Assad must surely realise that that is the only action on his part that would seriously jeopardise his position. He appears to be gaining ground in the civil war, but American bombing of military installations and other targets would of course seriously undermine his capacity to continue the war. And to what purpose? Chemical weapons are very terrible things, which is why they are banned under international law, but they are surely no more effective in subduing a civilian population than conventional weapons. I cannot really buy Cameron’s claim in the Commons debate that he is “testing the West’s resolve”. On the other hand rebel groups do clearly have an incentive to use them if they possess them (and it is not absolutely clear that they don’t despite western insistence on this point). The British, the French and the Americans have all insisted that the Syrian regime was responsible, but then they would, wouldn’t they? No neutral country, i.e. one that is not itching to attack Assad, has yet asserted this, and anyway the intelligence about all of this is still very hazy. We have not even yet had the UN inspectors report, which will surely answer a lot of questions – though not necessarily the identity of the culprits. It may well be that Assad was responsible, but let’s try to establish this point first before rushing into precipitate action. But let us assume that Assad was responsible for the attacks. Does this justify military intervention? Despite all the talk of precision bombing and surgical strikes, etc, etc, it is almost certainly the case that heavy attacks by cruise missiles would result in substantial civilian deaths. So we would be punishing Assad for killing civilians by killing civilians ourselves. It is just that our weapons would not be chemical ones, but civilian deaths are civilian deaths however they are brought about. And it is hypocritical, to put it mildly, for western powers to rail against chemical weapons use when they themselves have for decades manufactured and stockpiled them. The Americans used white phosphorus in Iraq, which I believe is a chemical weapon in all but name. We cannot calculate what would be the effect of heavy strikes against Assad, and what effect that might have on the balance of forces in the country. Would they be so heavy as to tip the balance in favour of the rebels, in which case it would amount to an attempt at regime change, the thing that the British and American governments have almost certainly desired, for whatever obscure geo-political reasons of their own, all along. But who would that enthrone in Syria? The Free Syrian movement of course strenuously disavows any connection with Al Qaida and other militant Islamic groups, but the situation on the ground is evidently so complex, and there are so many different contending groups that militant Islamists would surely be empowered in parts of the country. Conversely, if the American bombing were relatively light, i.e. punitive and deterrent, but not preventive, it might be utterly ineffective in having the desired deterrent effect. What if, some way down the line, further chemical atrocities were perpetrated? The US could scarcely just shrug its shoulders and go away after having committed itself to action. It would result in further and heavier bombing, which might still prove ineffectual. It should be remembered that in 1998 Kosova and Serbia endured very intense bombing for 75 days without yielding, and that ultimately it was only the threat of a land invasion that forced Milosevic’s surrender. Would there ultimately have to be a threat of a land invasion in Syria. Ever heard of mission creep. And it has to be said that the neo-cons and liberal interventionists who advocate bombing are always highly selective in their choice of enemy. It is currently Assad, but what about the numerous instances of attacks on civilians elsewhere in the world, not least the deliberate shooting of thousands of unarmed protesters in Egypt by the new military regime there. Not a peep out of the neo-cons about that, nor from Obama for that matter – in fact the US government still refuses even to admit that what happened in Egypt was a military coup, because that would mean they could not legally supply weapons to them. It looks very much as if “the West” is taking the side of the Sunni powers Egypt, Saudi Arabia and Qatar against the Shia powers, Syria and Iran, in the Islamic power struggle that seems to be taking shape in the Middle East at the moment. I strongly suspect that, contrary to appearances, Obama is not really at all keen on intervention against Syria, given that he was elected on a platform to extricate the US from its entanglements in Iraq and Afghanistan and that the very last thing he wants is yet another US war in the middle east. But he painted himself into a corner by denouncing in advance the use of chemical weapons last year, and now feels honour bound to follow through on this, especially given the pressure he is under from Senate hawks like McCain to take action. After all, before now it was Cameron who was desperately trying to inveigle Obama into action, not the other way around. He did not seem all that strident in his rhetoric, unlike John Kerry, who was breathing fire last week, and it may well be that he is also under pressure from within his administration from Kerry and others in the State Department. His decision to seek Congressional approval for any action was understandable from a political standpoint (though not necessary under the Constitution) but he must surely not have been unaware of the dovish mood in the House and in the country at large and the strong possibility that he might be defeated, just as Cameron was in Britain. Is that what he really wanted? Maybe. It would get him off the hook because he could scarcely seek Congressional approval and then go ahead if he failed to get it. And now the Russian initiative has given him another life-line. Obama was careful not to sound too ready to grab it in his address to the American people yesterday, not wanting to sound gullible or weak, but I fancy he is breathing sighs of relief and hoping that the Syrians will be sufficiently compliant with any chemical handover programme for him to announce “job done” at some time in the future, without any bombing. The claims that Putin is “playing him like a fiddle” overlook the point that Obama may see the whole thing as to his advantage, proving that diplomacy and the threat of force are more effective than the use of force. And Britain can congratulate itself on having divorced itself from any of this at the outset. SYRIA. Congratulations to the House of Commons for finally having made a sensible decision for once, and refusing to be dragged at the American's coat-tails yet again into another Middle Eastern imbroglio, the consequences of which are unforeseeable but probably catastrophic, as per Iraq. 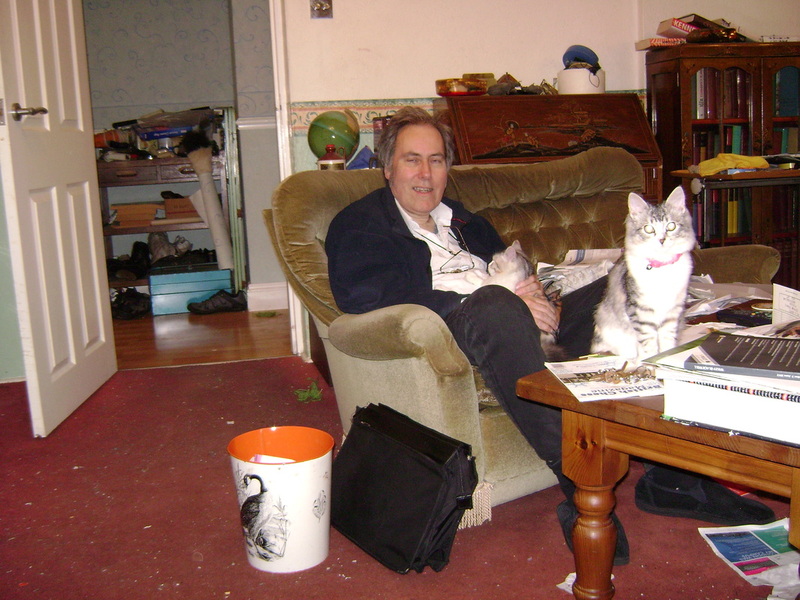 Me and one of my cats, Tabitha, in my living room.